Baby Boy is finally old enough to try table food. Not feeling particular antagonistic toward my Bundle o' Joy I decided that torturing him with jarred baby food could be avoided. So can baby food grinders and other expensive gadgets. All you need is the kitchen basics: cooking pot, water, food processor, spoon. - Cook the peas either by steaming or boiling. 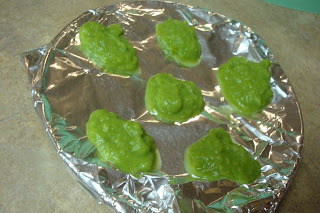 - Steal 1/4 cup of peas from the main bowl before you add salt, butter, or any other seasoning or sauce. - Put the peas in the food processor with 1 or 2 tablespoons of water, depending on how runny you want the finished food to be. - Process the peas until smooth. - Set aside a portion to cool for baby's dinner. Spoon the rest into small puddles on a plate and freeze overnight. Once frozen, the individual servings can be stored in a plastic bag in the freezer and reheated in the microwave in about 20 seconds, depending on the size of the serving. Sure, it doesn't look super yummy to you, but Baby will thank you. At least this is bright green and fresh, not the suspicious olive drab served in baby food jars. Also try: this recipe with steamed carrots. Also try: mashing an avocado with a fork and offering that to Baby. Note: To test for food allergies wait several days after introducing a new food before you introduce a second food to the baby's diet. In some cases food allergies are evident immediately (hives, red mouth, swelling of the throat). In other cases it may take three or four days for you to see the infant is having trouble digesting a food. Always get pediatrician approval before starting your child on solid foods. 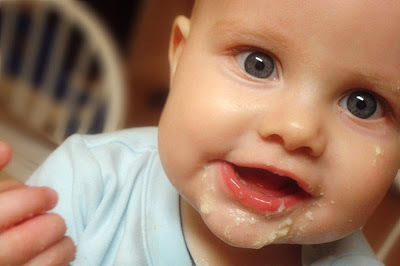 Most infants aren't ready to digest regular food until after four months old. Six months is recommend. Children should not be fully weaned from nursing until after their first birthday if possible. Cow's milk, dairy products, honey, and nut products should not be offered to the baby before their first birthday. Popcorn, nuts, and live-culture yogurt should not be offered until the child is over two years old. Some pediatricians recommend waiting longer for live-culture yogurts. Talk to your family doctor or pediatrician if you have questions. I sent you the new picture. Did you not like it??? You're cute. And it's such a great picture! Either version!